Two days after the worst of the flood, many of Jakarta's busiest streets are still inundated with flood waters. Grogol bus terminal still underwater 2 days after the floods. Rescue efforts and supply missions employed rafts to reach trapped residents. Jakartans band together to continue working amidst widespread flooding 2 days after the floods. 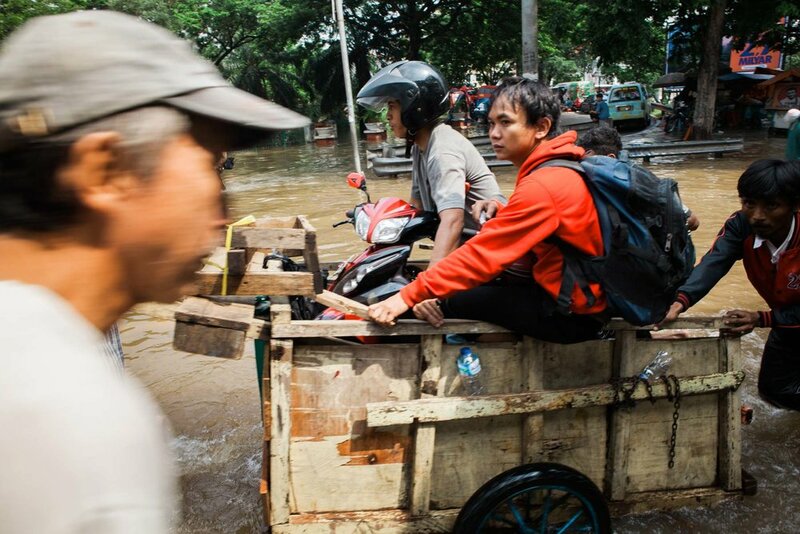 Local street vendors use their carts to transport people and motorbikes through the floodwaters. Despite flood waters, businesses opened to serve the community and to make up for lost revenue and inventory 2 days after the majot floods. Street carts that usually collect trash and recyclables serve as transportation for pedestrians and motorists just two days after the worst of the flooding. 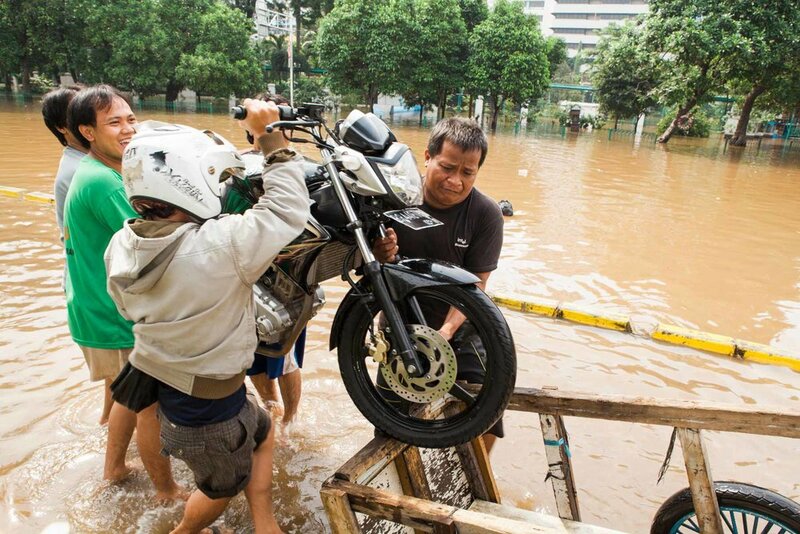 Jakarta's streets still flooded two days after the state of emergency was declared. Two days after the floods, residents band together to get back to business as usual. Two days after the flooding, grassroots organizations use Twitter to identify areas that are not receiving aid from the government and are still under water. These largely student run efforts collected donations of nonperishable food, bottled water, diapers, clothing and cash. One of the communal toilets ruined by the floods in Kampung Pulo, Jakarta. 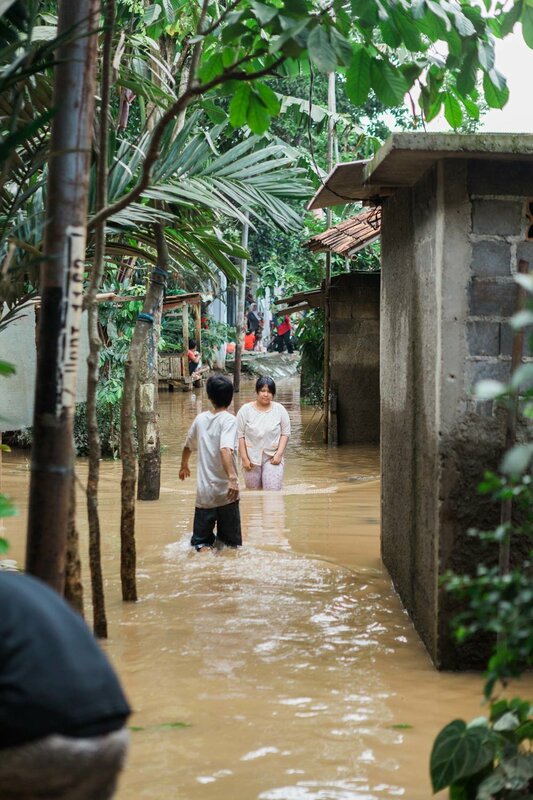 Kampung Pulo is regularly inundated with floods during the monsoon season due its proximity to the rising, sediment-filled and polluted Ciliwung River. 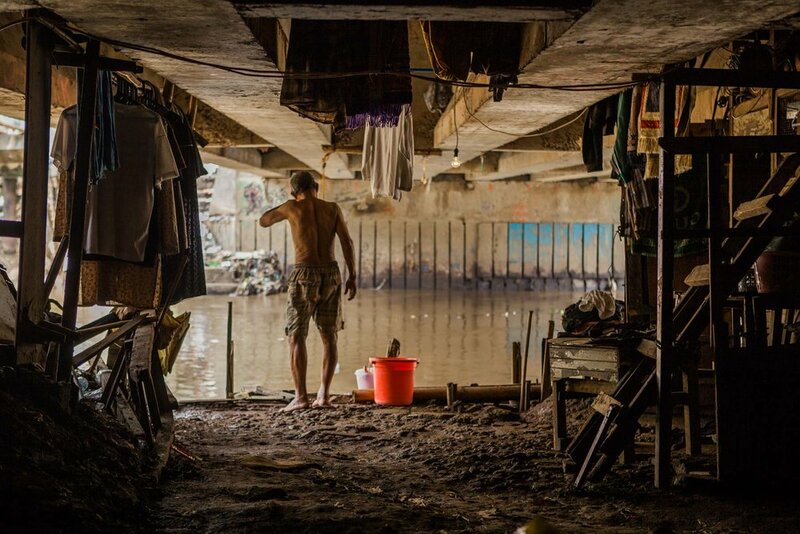 A Kampung Pulo resident washes his laundry in the sediment filled, highly polluted Ciliwung River. Houses were built generations ago on land owned by the city and federal government. City officials say the slum is unsafe for residents and is further polluting the Ciliwung River with their waste. According to local residents, each water pump in the neighborhood serves approximately 30-35 families. The Ciliwung Merdeka, a local community organization led by an ex-priest Mr. Santyawan is a safe haven for many of Ciliwung's residents. The Merdeka house hosts community events, workshops for sustainable building and classes for the children in the community. The Ciliwung Merdeka has also been at the forefront, representing the Kampung Pulo residents in their efforts to stay at their current location despite the government's request for relocation. One of the mosques in the neighborhood is finally cleaned and opened again after the January 17, 2013 floods. Flood water rose to almost 2 meters in some places in Kampung Pulo, forcing residents to seek refuge on their roofs. Once regarded as one of the most crime ridden parts of the city, Kampung Pulo has transformed into a vibrant, welcoming community due to the efforts of Mr. Santyawan and the Ciliwung Merdeka. Kampong Melayu lies along the arterial Ciliwung River in Jakarta, Indonesia. This raft connects the community living on either side of the river. It transports children to school and also serves vendors who supply the local markets. The Kampung Pulo community has developed a few micro economies to sustain itself including processing chicken for local markets around the city. Kampung Pulo residents slaughter and process chicken for selling at local markets around Jakarta. Several Kampung Pulo make natural fiber brooms and sell them to street vendors who then distribute them through neighborhoods across Jakarta. Residents took to these rooftops on January 17, 2013 in Kampung Pulo to survive the worst monsoon flooding Jakarta had seen since 2007. 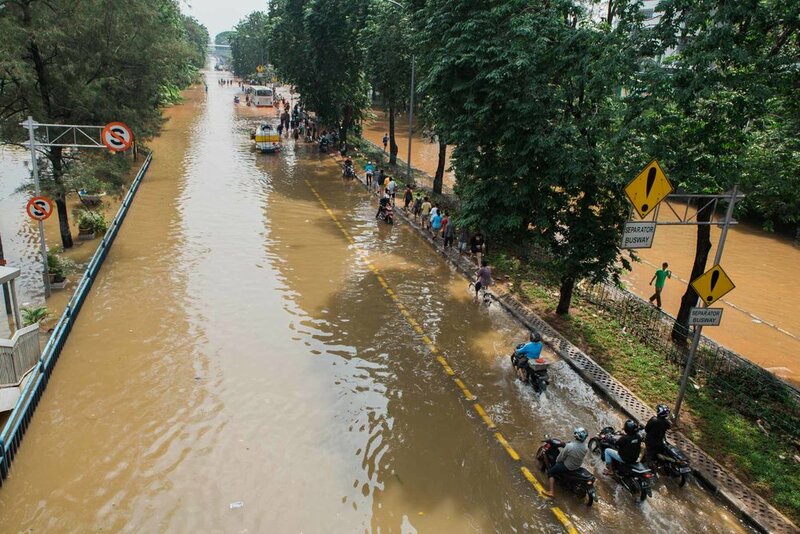 On January 17, 2013, Jakarta, Indonesia was hit with the worst flooding they had experienced since 2007. 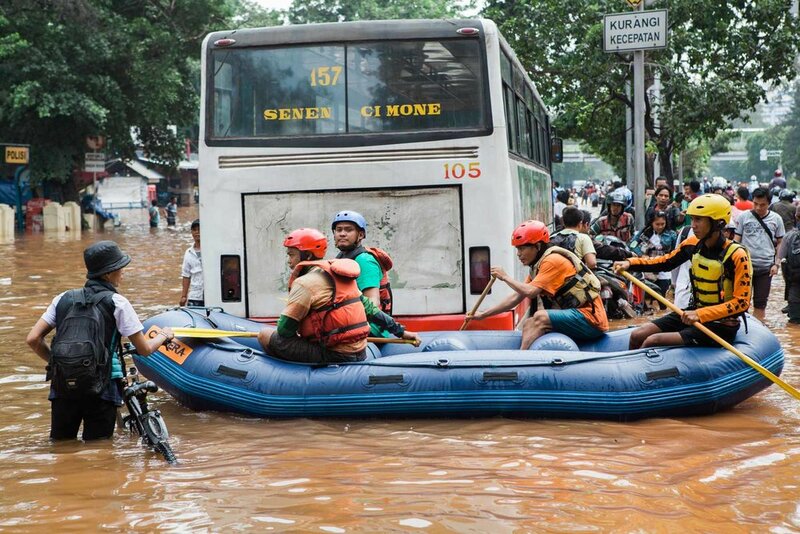 The flood claimed 15 lives in the Indonesian capital city. Kampung Melayu, along the Ciliwung River, was one of the worst hit neighborhoods. People waited for aid on their roofs in an area where the flood waters rose up to 2-meters. 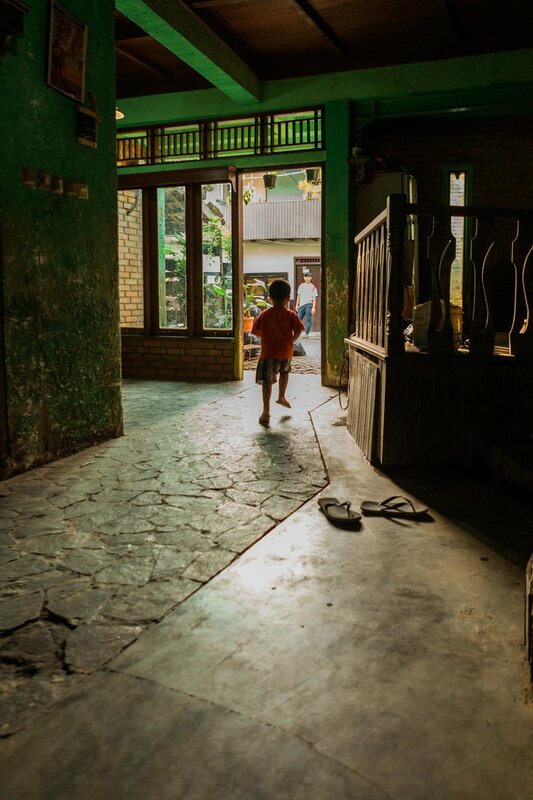 The Kampung Melayu community was previously one of Jakarta's most crime ridden neighborhoods. Over the last 15 years, Ciliwung Merdeka, a community organization, has lead efforts to clean up the neighborhood, and build a thriving micro economy. 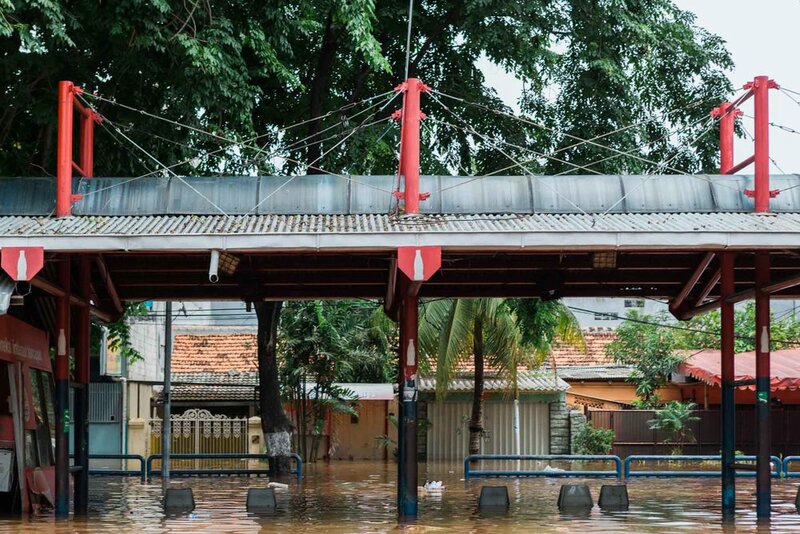 In their efforts to prevent further flood crises, both the local city government and the Indonesian government have vowed to clean up the Ciliwung River. These efforts will eventually lead to the eviction of Jakarta's poorest neighborhoods. While the city has promised alternative housing options within the city, Kampung Melayu residents argue that the financial and cultural fallout is too great to bear.